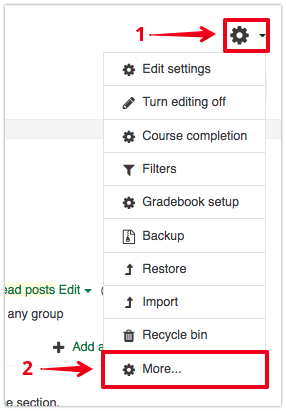 On eClass, instructors can set up courses so that students can track the completion of items in their course. Items can be marked as complete manually by the students or based on the conditions set by the instructor. Once activities are set up to be counted as complete, this can be used as a criteria to restrict access to activities, for example to require students to view a reading before completing an assignment. Completion tracking can also be used to count an entire course as complete, though this generally would not apply for Bear Tracks credit sections. This could be useful for non-credit situations such as accreditation courses, placement tests, and professional development purposes. 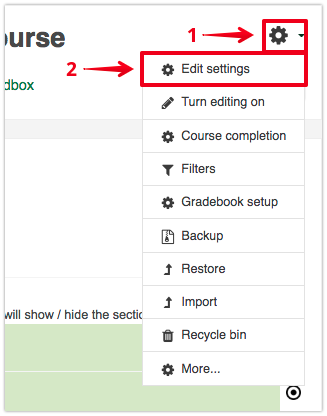 Click on the gear icon on your course main page, then on Edit settings. 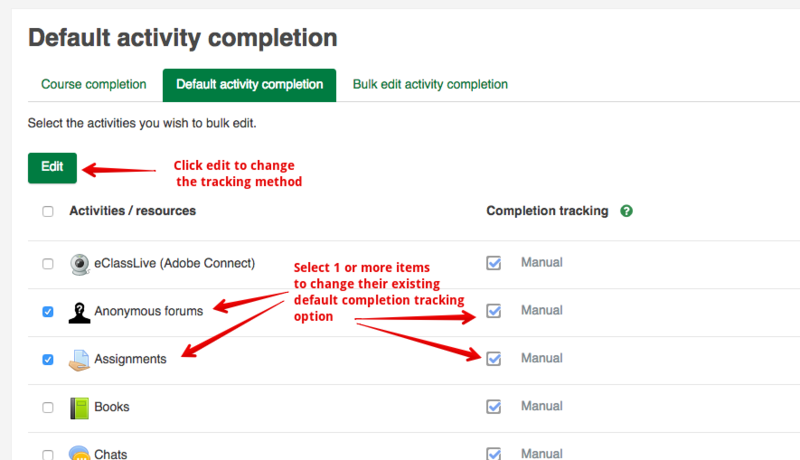 Scroll down to the "Completion tracking" section and set the "Enable completion tracking" dropdown menu to Yes. Click Save changes. Once this is enabled, in every activity and resource a new area of the settings (Activity completion) will be available. 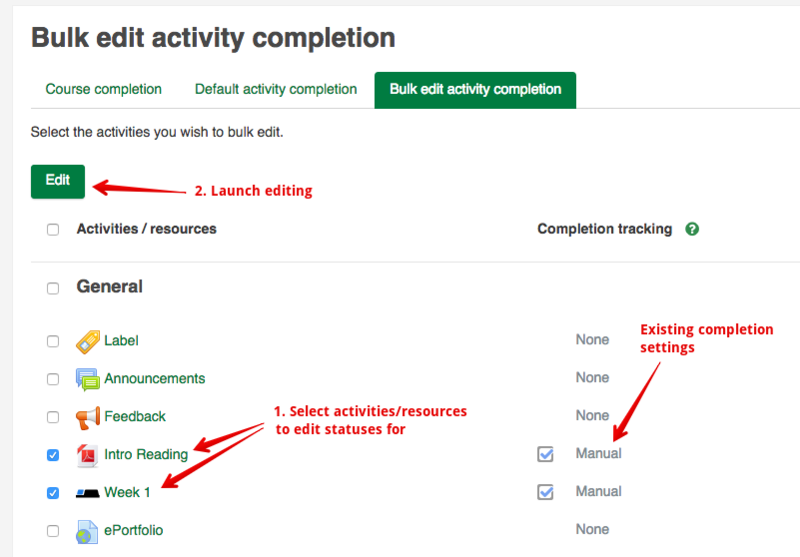 Ensure you have turned editing on, then click Edit > Edit settings to the right of the desired activity/resource. "Do not indicate activity completion" - disables completion tracking for a particular item - this is the default. 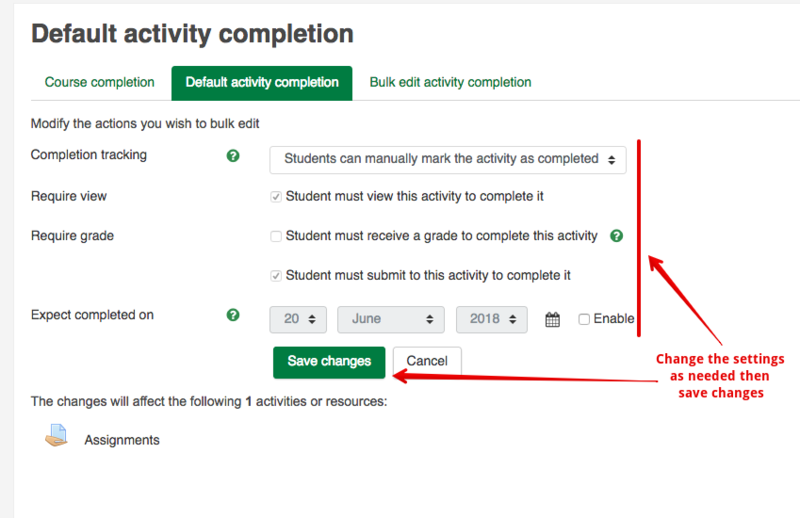 "Students can manually mark the activity as completed" - adds a checkbox to the right of an item allowing students to manually track completed activities by marking off the corresponding checkboxes. This option is best if you want to allow students to personally manage and keep track of their own progress. "Show activity as complete when conditions are met" - automatically marks the activity as complete based on set criteria. "Require view" - Student must view this activity to complete it. "Require grade" - Student must receive a grade to complete this activity. "Require passing grade" - Quizzes only: Student must receive a passing grade to complete this activity. The passing grade for an activity can be set under Grade in the quiz's settings by editing the "Grade to pass". "Require posts" - Forums only: Student must post x discussions or replies. "Require discussions" - Forums only: Student must create x discussions. "Require replies" - Forums only: Student must post x replies. 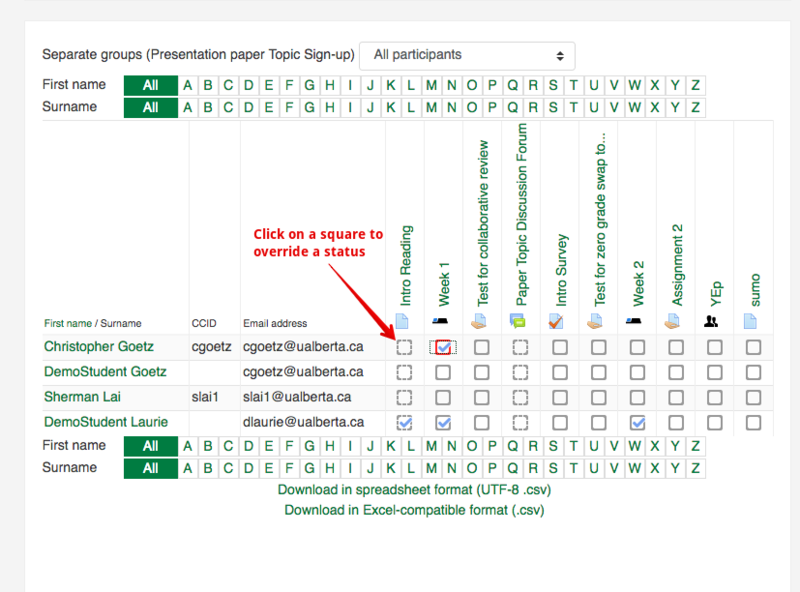 "Require submission" - Assignments only: Student must submit this activity to complete it. The last 'Expect completed on' setting allows you to specifies the date when the activity is expected to be completed. This date is not shown to students and is only displayed in the activity completion report for your reference. Click on the gear icon on your course main page, then on More. 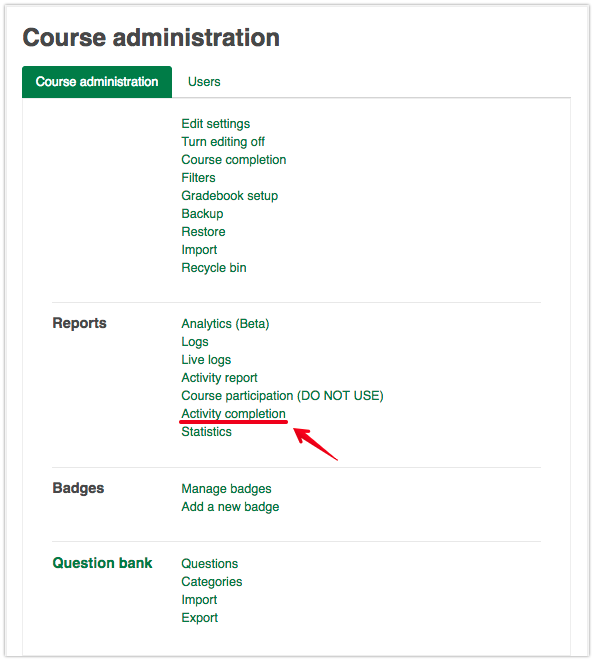 On the Course administration page, click on the Activity completion link. 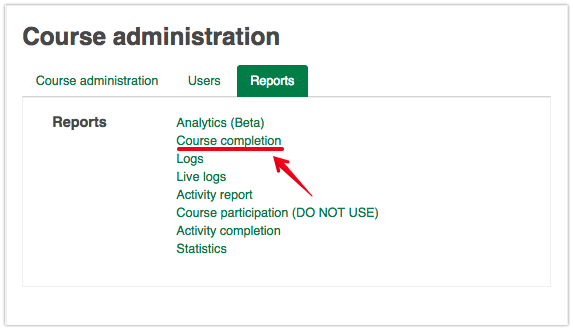 Click on the gear icon on your course main page, then on Course completion. (This option will not be available until you enable completion tracking). 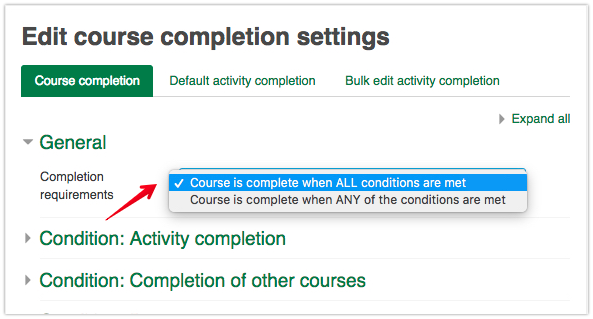 In the general area of the 'Course completion' tab, click on the Completion requirements dropdown menu and choose whether your course will be aggregated based on the completion of ALL conditions or ANY condition(s). 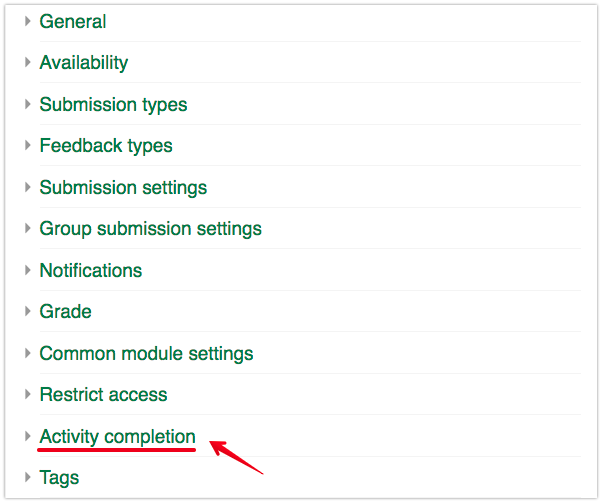 "Activity completion" allows you to tie course completion to the completion of any activity or resource within the course. "Completion of other courses" allows you to tie course completion in the current course to completion of other courses. "Date" allows you to set a cut-off date in which the course will be declared complete or incomplete. "Enrollment duration" allows you to choose the number of days after enrollment when the course will be declared as complete or incomplete. "Unenrollment" allows you to declare the course as completed once the student is unenrolled. "Course Grade" allows you to set a specific grade in the course that must be achieved to count it complete. 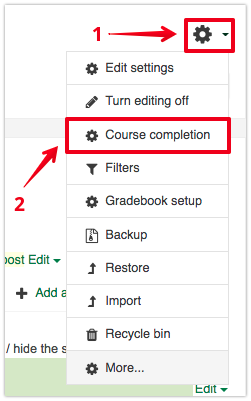 "Manual self completion" allows students to mark their own course as complete (Note: Self completion block must be added). "Manual completion by others" allows users with specific roles to mark the course as complete. Add a checkmark next to the corresponding roles. You may also choose whether all or any of the selected roles need to mark the activity as completed. 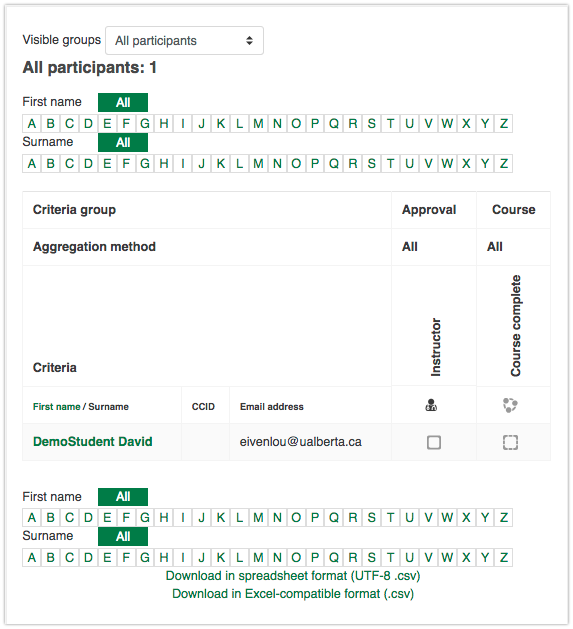 When this is done, a new option will appear in the course reports area 'Course completion' which provides a list of all students who have met the course completion criteria.